This Tex-Mex is gluten-free and vegetarian. A great meal for everyone! Serves 4 as main course, or 8 as a side dish. 2. In a large nonstick skillet, heat oil over medium heat. Add onion and garlic. Sauté until onion is soft. 3. Add red bell pepper and green bell pepper. Sauté until tender crisp. 4. Add cumin, chili powder, salt and pepper. Sauté 1 minute, being careful spices don’t burn. 5. Add salsa, black beans, kidney beans and corn. Mix well and sauté until heated through. 6. Meanwhile, boil pasta according to directions on box. Drain, rinsing quickly. Add to skillet and mix until well combined. 7. 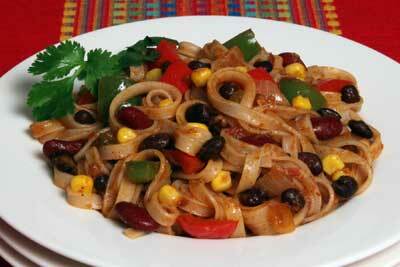 Pour into your favorite pasta platter and garnish with cilantro or Monterey Jack cheese.